Do you have teeth that are crooked or crowded or have large gaps? Do you have problems with your bite? Is the centerline of your upper teeth not lined up with the centerline of your lower teeth? If so, you are a candidate for orthodontics, for wearing braces. In the past, the idea of braces could not be separated from metal, since all braces were composed of metal brackets and wires. Today, there is an alternative: clear plastic aligners that are virtually invisible but get the same results as those ugly metal braces. Too good to be true? Watch this Invisalign video and decide for yourself. 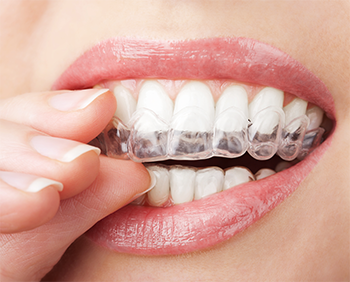 Invisalign® is a system of clear aligning trays. You wear each set of upper and lower trays for two weeks, at which time a new set will arrive in the mail. As you change from set to set, your teeth are moved, very gradually, into slightly new positions, little by little, until they reach their final places. After your initial consultation, when you’ll discuss with Dr. Wojtkun whether Invisalign® is the right solution for you, you will have x-rays, measurements and/or impressions of your teeth made. With the help of the Invisalign® laboratory’s 3D image technology, Dr. Wojtkun will design a treatment plan and share with you computer-generated images to give you a glimpse of the final result – your new smile. When the first set of aligners arrives from the lab, we will try them on you to make sure they fit. After that, there will be very few office visits, unlike with metal braces that constantly need professional adjustment or repair. At home, you simply wear your aligners all the time, except when eating, brushing, flossing, or rinsing. You can even choose to take them out for a special occasion, like a wedding, class reunion, or important date. The whole process takes from nine to fifteen months, on the average, using between 18 and 30 sets of aligners. Naturally, the time is variable, depending on your individual case. Invisalign® Express is for light cases and cases where people have worn braces in the past, but still need bite correction. This program requires ten or fewer aligner sets and takes as little as 20 weeks (plus any required time for a retainer program). Custom shaped aligners allow permanent teeth to grow in without obstruction. Aligners include Blue Dot Wear Indicators, to alert teens when it is time to change to the next set of aligners. If your teen loses things, don’t worry. Free replacement aligners are provided in this program. Invisalign® Clear Braces have been used in clinical trials and orthodontic practices across the country with great success. Since treatment time is about the same as for traditional metal braces, but by a far more comfortable, convenient and attractive process, patients have understandably been very satisfied. Read Invisalign® Success Stories to see what people say. Contact us for an appointment to discuss your future with beautiful, straight teeth.